Lately something has been bugging me. 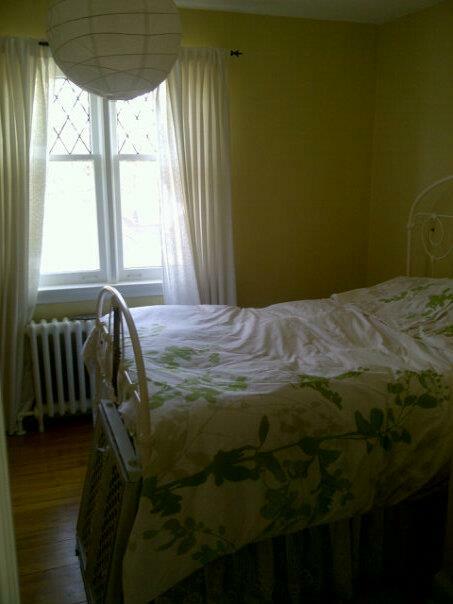 I couldn't figure it out for awhile and when looking at photos of our old house I realized I missed Norah's old room. I spent hours making the tree for her old room and it is the only thing from our old house that I miss. 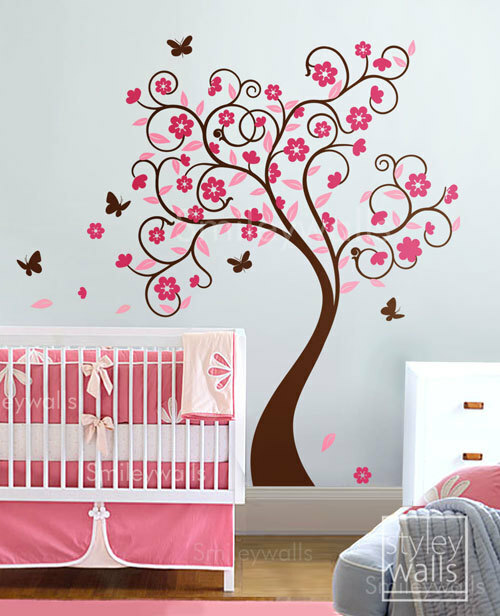 Oh I was so proud of this tree in Norah's first room! 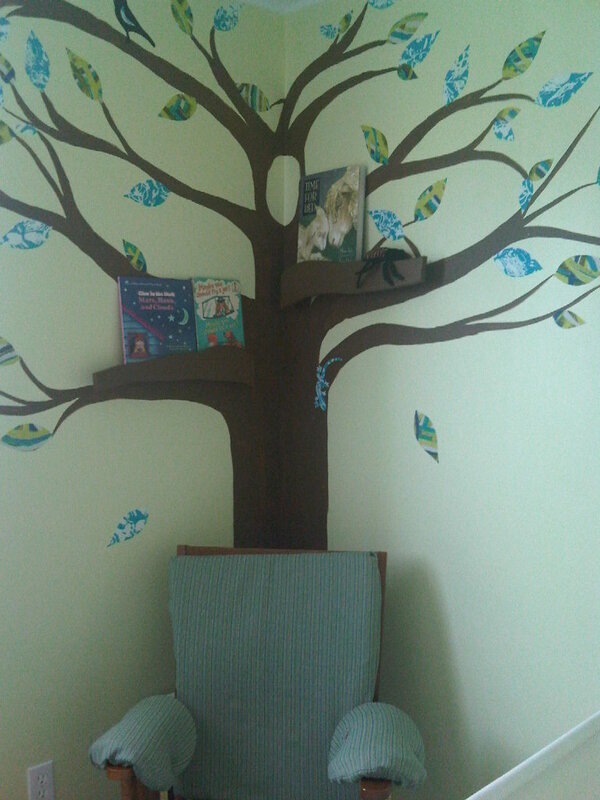 To see how I did the first tree in Norah's old room go here for the trunk, here for the leaves and here for the shelves. Norah turns 2 in February... AHHHHHH when did she get this big!! And lately she LOVES taking her naps in our spare bedroom bed! When I say loves I mean she refuses to nap in her crib and will only nap in her big girl bed. She is ready for the bed and the only thing holding her back is me.... This bed was mine growing up and its VERY high!! Ryan and I just haven't found the time to drop the mattress by taking out the box spring and installing the safety railing on the bed. Plus I don't want to move her into a room that isn't decorated!! This is a horrible photo of the spare room but apparently its the best one I have... Since this photo we have actually turned the bed sideways into the nook on the right side. I realized about a week ago that I REALLY wanted another tree for her room! And when I get a thought in my mind I just can't get rid of it. I also knew I wanted to do butterflies this time! So I did what I always do when I have an idea... I spent a few hours hunting Pinterest for ideas and found this tree decal on Etsy. 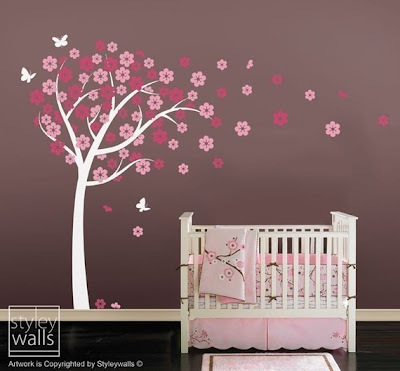 I loved it but realized the swirling branches would be difficult to do for me... I wanted to keep this simple just like last time. Then I found this one and thought it was perfect. So using a pencil and an eraser I drew my tree using this one as a rough sample. It took me all of about 15 minutes to draw the tree. Then using brown craft paint I painted the tree. Last time I went out and bought a can of wall paint and barely used the can and then left it at the old house... SO to keep things on the cheaper side I just used dollar store brown craft paint. I used less than half of a tube of it too and I love how the tree looks!! 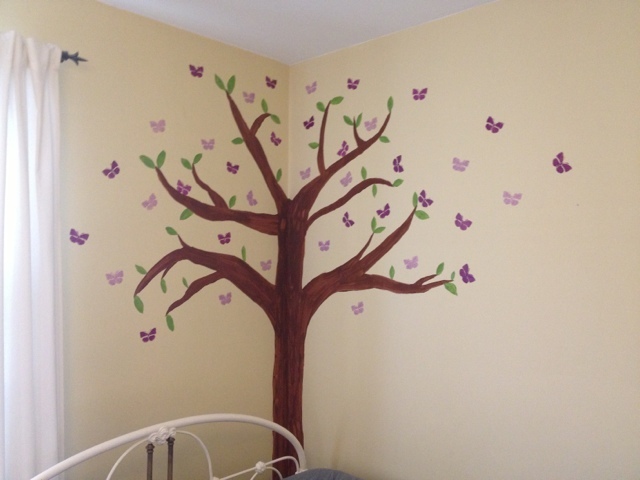 After drawing the tree I pulled out my butterfly stencil and using different colours of purple dollar store craft paint and a sponge stenciling brush I randomly put butterflies all around my tree. This maybe took a half hour. When I was finished I took a step back and starred at it for awhile. I wasn't overly happy with it... something was missing! So I pulled out some green craft paint and added random leaves by hand all over the tree until I was happy. So here is the new tree for Norah! I do still plan on adding some 3D butterflies on the branches and the wall but as for the painting I am finished!! I LOVE this tree!!! I'm SO proud of myself!! You have to remember that I'm an accountant and although I may be a crafty person I CANNOT DRAW OR PAINT if my life depended on it!! When Norah asks me to draw Mickey Mouse she will look at my drawing and shake her head saying "No Mama Wrong!" SO just because you have zero skills doesn't mean you can't create something like this too!! I had to constantly remind myself that trees are not perfect so I really can't make a mistake with this!! Just for reference the walls are still a pale yellow, closer to the colour in the original photo of the spare bedroom above. This photo makes it look beige but its definitely yellow!! I'm so excited to decorate the rest of her room... now I just have to gather up ideas from Pinterest! !